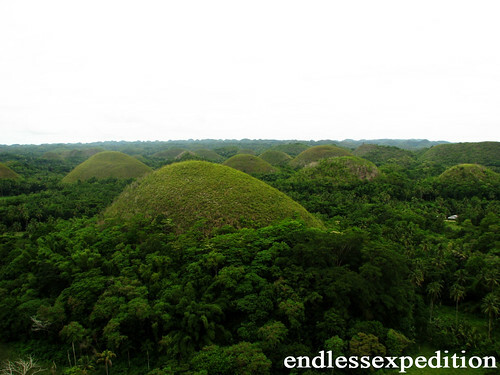 Spread on 50 square kilometers in the Heart of the Bohol Province, the Chocolate Hills, about 1,800 Hills according to the latest survey, is a breath-taking attraction that is truly magnificent. Concentrated along six municipalities in the province, these unusual land form is covered by fresh, green grass especially in the mild, rainy season, but turns brown during the dry season. As it turns brown, all these hills resemble the look of an endless row of Chocolate Kisses throughout the area, the reason it got it's name. It is also been proposed to be included among the list of UNESCO World Heritage Sites. Legend says that once upon a long time ago, there were two giants that are mortal enemies. as they feuded along, they threw in sands, rocks, boulders and the likes. The fight lasted for a number of days until they both got tired and decided to end the feud. They became friends after a few days rest and as they went away, they forgot to clean up the area and then it became the Chocolate Hills. The fee to the Park that is located on a view deck above a Chocolate Hill was Php 50.00 around 1 USD. 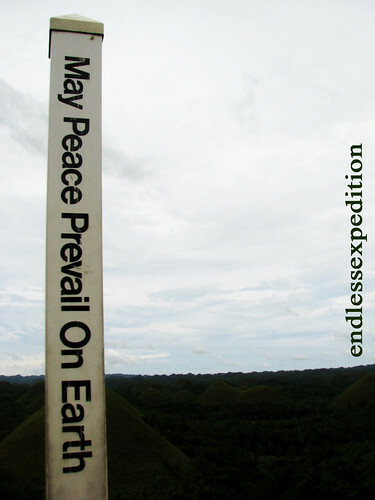 it has a long strech of stairs that will truly tire you but I really think this was done on purpose because as you reach the topmost step, you will have a spectacular endless view of the Chocolate hills. Hundreds of Tourists from all parts of the Philippines and of the world were all awestruck by the view at that very moment! Koreans and Europeans were truly amazed and they can't resist but take a shot of the hills and themselves, with the hills, as well. 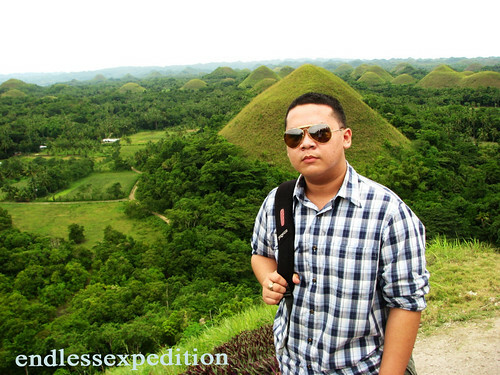 It was a truly liberating experience for me, of course, because I can never ever tell that I went to Bohol if I have never been to the World Famous Chocolate Hills. 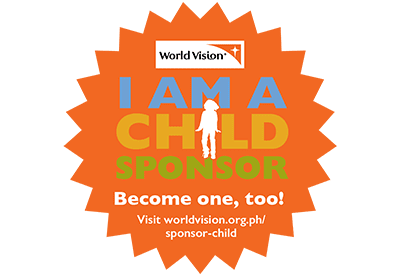 It is even featured on the Provincial Flag and Seal of Bohol because I personally believe that if you say Bohol, the first thing that will come to any Filipino's mind is the Chocolate Hills then the Tarsier. A portrait of me shot by my Kuya with the Chocolate Hills. If I would be coming back to Bohol, I would never ever miss the chance to have the slightest view of this Magical Chocolate Hills. It will bring you a different feel the moment you see it and the second you see the eyes of the other tourists light up at the sight of the Hills. I am pretty sure mine lit up as well and so would yours!